On Friday, August 7, 1998 we traveled three hours to the Blackwater River State Park in northwest Florida . After driving through several strong summer afternoon thunderstorms we finally arrived at the park. Luckily, most of our gear remained dry through the downpours. 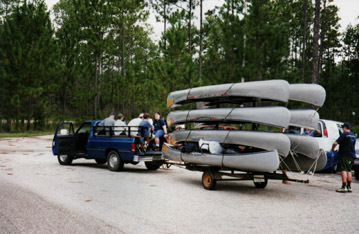 Once there, we rented our canoes and drove to a parking lot where we loaded our gear and ourselves into the outfitter's truck. From there we then drove through the rain and mist to our drop-off point, several miles from the park entrance. 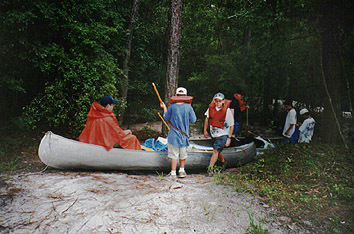 Quickly we unloaded the canoes, filled them with our gear and slid them down the bank into the river. And so we began our adventure down the swift and turning Blackwater River.